Every year, we ask for predictions from Sidepodcast readers, and 2014 saw a great batch of forecasts, suggestions, and just plain guessing about what was going to happen in the season still to come. As always, we don't let the predictions disappear into the ether, we drag them out, dust them off and highlight the good and the bad. Who was spot on and who couldn't have been wider of the mark? Here are the pick of the 2014 Sidepodcast predictions. With a clear advantage after three weeks of pre-season testing, it was obvious that Mercedes were going to do pretty well during the year ahead. As F said: "I'm expecting a win for Bottas and a dull straightforward title for Mercedes." He even accurately predicted them "dominating the first 7 races, whereby they win 6 of them." That's exactly what happened with Daniel Ricciardo taking the other victory. Sadly, Bottas didn't take a win in 2014, but was close on a couple of occasions. Williams' improved pace came as a surprise to most. Having the Mercedes power unit in the back was expected to be a help but many predicted McLaren would benefit the most. I think it is clear that the big advantage to have this year is Mercedes horses in the back so the championship could turn into a Mercedes - McLaren shoot out with Williams and Force India competing for the minor places. Ryan's predictioning skills were very detailed, listing out the top ten for both driver and team championships. His constructor forecast was: "Mercedes, Ferrari, McLaren, Red Bull, Force India." Williams were just outside the top five. Jack was incredibly optimistic for McLaren: "One of the top 3 teams (at least at the start). Button will get a few wins, but I think he'll miss out on the championship, and finish the season in the top 6. Hard to tell with Magnussen, but I'm not expecting a win in his rookie season. The team will be in the top 4 and might have an outside chance at the Constructors title." Others were slightly more positive about the chances for Williams. Pat had them joining the fight near the top: "Lotus and Force India will be rejoined by a resurgent Williams, who'll score several podiums. The continuing saga of Force India's money will roll on and on." Lou suggested Jenson Button would win two races during the year, but it might be good that he didn't as JaniceMarie threatened to "cry a river" if he'd succeeded to do so. The fate of Caterham and Marussia hangs in the balance, erring towards withdrawal from Formula One. At the start of the year, the predictions surrounding these two teams varied wildly - from optimistic thoughts of them capitalising on the misfortune of others, to the realisation that they've been in the sport long enough to do better. Will was on the more positive side, with his weather report style forecast: "Caterham and Marussia - potential improving, attrition rate of the field moderate to high, so chance of scoring a point very good. Ryan had some hit and miss thoughts in this next comment, but more hits than misses if you look at the season as a whole. This will be the last season for both Caterham and Lotus. Ericsson will not return in 2015 for another team, Vergne will end up on the same scrapheap as Scott Speed and Christian Klien... A generally unknown 18 year old will sign for a F1 team in 2015, people will say that 'if he's quick enough he's old enough' or 'racing in the junior series really helped me mature'. Pat accurately predicted Marussia joining those that have scored points in Formula One, but wasn't sure if Caterham could do the same. "In testing Caterham didn't seem to have caught the others at all, which is a shame. But still they could score a point or two if their car can finish and others do not. And their testing was a nightmare so they *might* catch up. I don't see it, but they might." Jack also had some faith that Caterham could haul themselves into the top ten at least once. "Still fighting with Marussia at the back. If the reliability we saw in testing continues, I could see them getting their first points. As nice as it is to have Kamui back, I don't see him having much success. No clue about Ericsson." Poor Ericsson, and the worst part is we really still don't have a clue a whole year later. 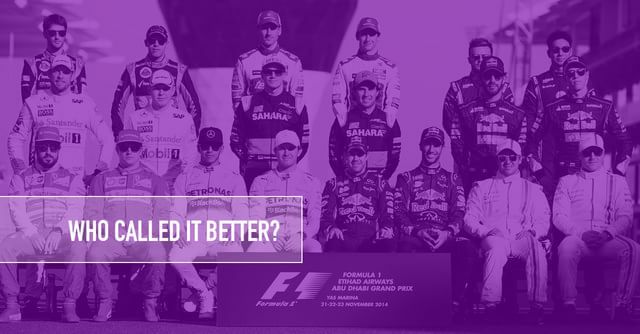 It wasn't all about drivers and teams, some of our predictioners had thoughts on other F1 related items. Lou wasn't feeling too hopeful about the chances of a good race in Bahrain, saying: "Bahrain night race to be no more special than the race is during the day." It turned out to be a pretty epic race in the desert, although how much of that was down to the time of day is debatable. Ryan got specific about the weather: "There will be three wet races (Malaysia, Germany and Austria), in which one will be under a safety car start." And also hit the nail on the head with regards to the two new rounds: "Media and public complain that Russian Grand Prix is still going ahead two weeks before the race is scheduled to be held. The Sochi circuit to be renamed Valencia mk II. No team orders will be used in Austria." Pat wasn't convinced that the first race of the year would be the reliability nightmare that even the team bosses were predicting. I think instead of pushing it and having cars not finish races we will see teams turn the settings down and have the drivers cruise. They did that early in the season, especially Melbourne, when the switch from V10s to V8s happened, I expect Melbourne this year to be the same. So instead of cars dropping out they'll slow down. Prepared teams will still take advantage and take the points. Away from the racing itself, L Croft had a thought about those in charge, saying simply: "I predict that in 2014 Bernie will hand over the keys to F1 to his successor..." We're still waiting for that, but it does seem to be closer than ever. Maybe. Hopefully. One of the key things to do when you're looking ahead to a season of Formula One, is to place your bets on who will take the championship. We saw a handful of predictions and, naturally, based on the evidence of pre-season testing, the choice was between the two Mercedes drivers. And just like the championship that followed, there wasn't much to choose between them. In the end, the prediction of the year has to go to Ryan who quite accurately (and thankfully) nailed the situation with that regulation change. "The double points rule, despite everyone saying it will change everything, changes nothing." Do make sure you take a look at the entire predictions thread as there are some really interesting nuggets, classic clangers, and other fun things to note. Also note that whilst it's all very well sitting there laughing about the 2014 efforts, it will soon be time for me to canvas for your 2015 predictions. With so many ways to get in touch, there's really no excuse.